TEKEASE provides highly skilled Technicians who specialize in caring for personal computers, networks and other technology solutions. Our Computer Trauma Units™ are equipped with all of the essential parts and equipment to repair to provide you with quick and reliable technology care solutions 24 x 7 x 365. Our super fast online scheduling is available 24 hours a day. Just give us a call or schedule online. We will have one of our trained technicians at your home or small business fast! Our convenient scheduling provides emergency same-day, weekend and evening appointments. We will do whatever it takes to accommodate your schedule. We provide affordable computer repair and technology solutions. Also, we will match or beat any local competitor’s advertised rates! We match our technician certifications with your specific technology requirements to ensure we send the right person for the right task. We guarantee our services with our 100% Total Satisfaction Guarantee! Our certified technician’s are credentialed by CompTIA. We support all brands of computers and software including Dell, HP, and Apple. Our technicians have helped thousands of small businesses and residential clients with their technology. Local Service • Nationwide Coverage. TEKEASE has thousands of technicians available nationwide to support your home or small business technology. 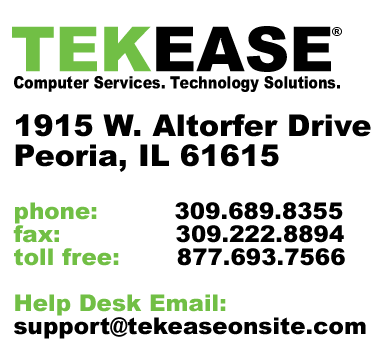 Whether it is for your home or office, a PC, MAC or Network issue, TEKEASE has you covered. Call TEKEASE at 309.689.8355 or 877.693.7566 to speak with a certified technicians who will help you solve your technology problems with ease.